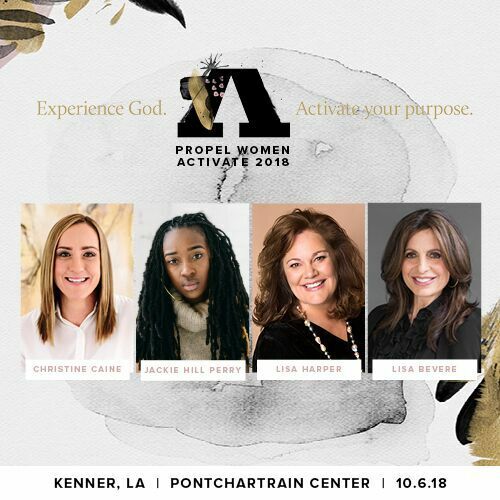 PROPEL WOMEN ACTIVATE 2018 is a one day experience where women gather together in the presence of God to be propelled into the purposes of God. Join speakers and artists Lisa Harper, Christine Caine, Lisa Bevere, Karen Harmon, Jackie Hill Perry, Rosilyn Houston, Dianna Napstad, Denise Gitsham, and Jenn Johnsong with Bethel Music and more! • Gain empowering wisdom from Christine Caine and other inspirational speakers. • Learn from women, in every stage and season of life, who are walking in their God-given purposes. • Find community with a diverse group of like-minded women. • Discover, strengthen, and activate your God-given purpose. © 2019 Pontchartrain Center. All rights reserved.